She's got a big mouth, you'll notice it. A 1988 Mickey's Big Mouth malt liquor ad. That's what girls are for. A 1967 ad for Drummond. Obvious reaction for a woman. A 1971 ad for d-CON's mouse killer. "Should you offer? After all, if she likes the offer, she might start to play. No strings attached"
"Even rain can't hide that Microsheen shine!" 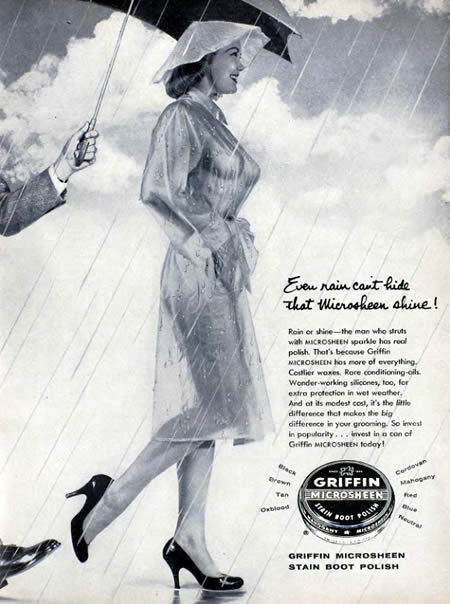 A 1957 Griffin Microsheen ad using women to sell shoe polish. Don't leave boy, she just doesn't know! This ad for Zonite, a feminine hygiene solution, impresses on good wives the humiliation and loathing they'll experience if hubbies have to deal with their natural aromas. But that's okay - the text considerately reads, "Is a wife to blame if she doesn't know these intimate physical facts?" 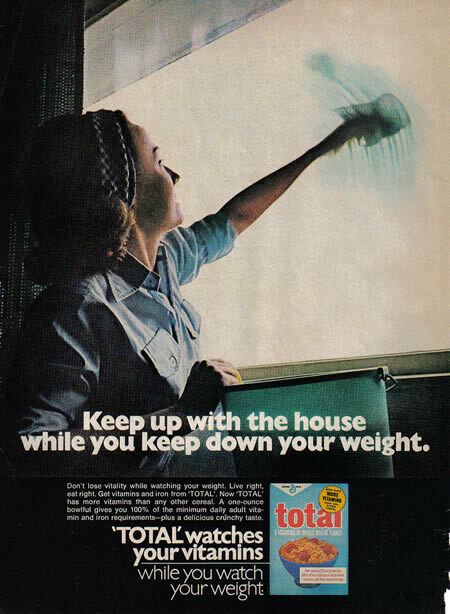 Don't you dare get fat and start slacking on your household chores! Found on a 1970 Family Circle Mag. "Demure deodorizes. Deodorizes so thoroughly, so pleasantly, you know you're the woman your husband wants you to be." 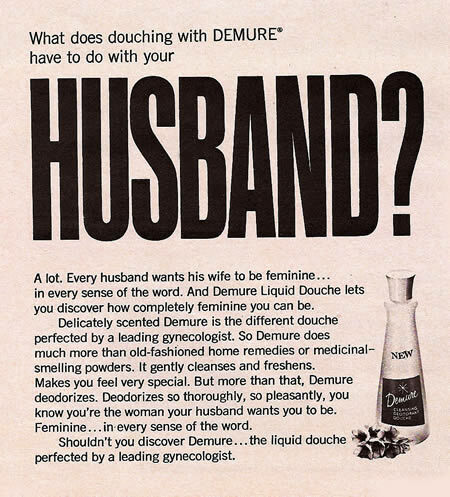 A 1969 Demure douche ad. 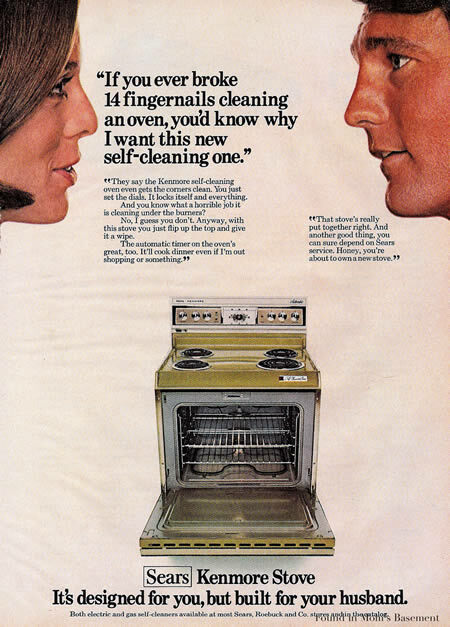 This 1971 Kenmore stove was "Designed for you, but built for your husband." He's more important of course. We all know women ruin the evenings. 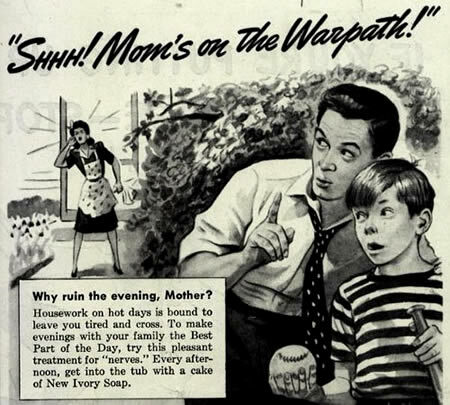 A 1942 Ivory Soap ad, published on the Saturday Evening Post. 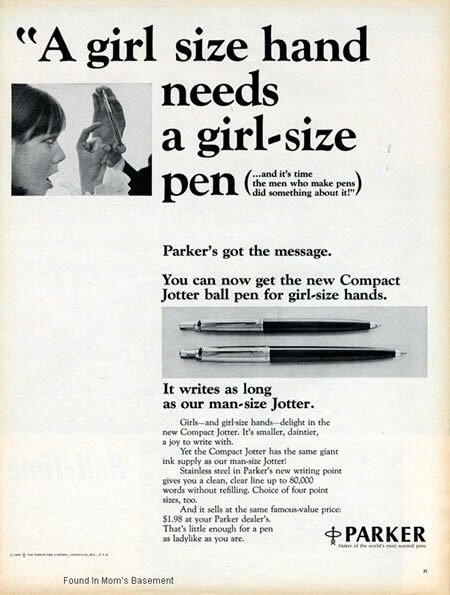 A 1966 ad for Parker. You see, girls can't even hold a pen.